In 2015 Middletown native Joey Logano won the Daytona 500 for the first time. But long before Logano was born, it was Pete Hamilton that became the first driver from New England to win stock car racing’s biggest event. 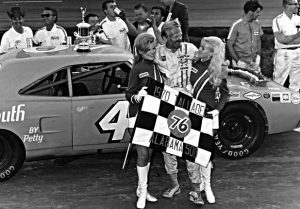 Hamilton, the 1970 Daytona 500 winner and a native of Newton, Mass., passed away Wednesday. Hamilton was 74 years old. Hamilton was inducted in the New England Antique Racers New England Auto Racers Hall of Fame as part of the Hall’s first induction class in 1998. Hamilton rise through the sport was meteoric. He began his racing career at the former Norwood (Mass.) Arena 1962 and after racing locally for a short period NASCAR National Sportsman championship in 1967. Hamilton began racing in NASCAR’s top level Grand National division (Monster Energy Cup today) in 1968 and was named the divisions Rookie of the Year that season. In 1970, driving for Petty Enterprises, Hamilton won the Daytona 500. He went on to score two more victories in the top level division that season at Talladega Superspeedway. Hamilton retired from full-time competition after the 1971 season because of a neck injury. Pete was a joy to watch and a gentleman to all the fans. Early in his career, he raced at one of Upstate NY’s popular tracks, Fonda Speedway. Pete was a rather shy individual, but he always managed to speak with the fans after the race. Prior to his leaving the New England area, he attended the Dale Carnegie School of Communication near Albany, NY. When that information became public, I just had the feeling that he was destined for a larger role in NASCAR. And the rest is history. RIP to Pete and thank you for so many memories. I was also at the closed circuit broadcast in Hartford that day. There can’t be many around that were there back then. That was the absolute best way to see a racethat I have ever witnessed. Better than sitting in your living room and better than sitting in the stands at Daytona with binoculars. The fantastic energy of a big crowd (about 500 people, I forget if that was a bigger place) with the comfort of being in a nice place and the good view of a broadcast on a giant screen. We also went to Springfield, MA and Albany NY on the other years.Long time ago. Hamilton was just a kid; hard to believe he is gone at 74 already.